In the UK spoons are posted first class and overseas they are posted tracked and signed for. Please note packages to US, Canada and other countries can take a few days and sometimes up to 2 weeks to arrive, you can monitor progress with the tracking code I’ll email to you. I post packages as soon as possible, usually within 2 working days. Occassionally I am working away and then I will email you to inform you of any delay in sending. 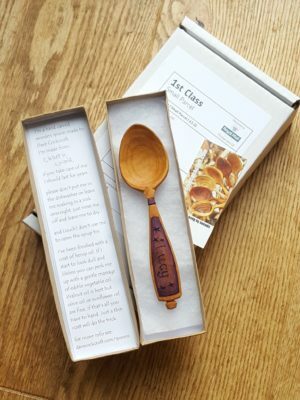 Eating spoons come with a small presentation box and some care instructions. Delivery of stools, chairs and other items is arranged individually for each item when you arrange the purchase with me. As an example muscians stools posted in the UK will cost £20, tracked and signed for.